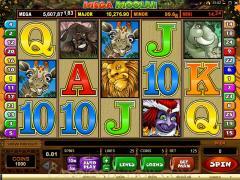 Mega Moolah is a four-tier progressive jackpot slot game designed by Microgaming, the most accomplished company in the online casino software business. This is a five-reel game with 25 paylines where the maximum wager is 125 coins. 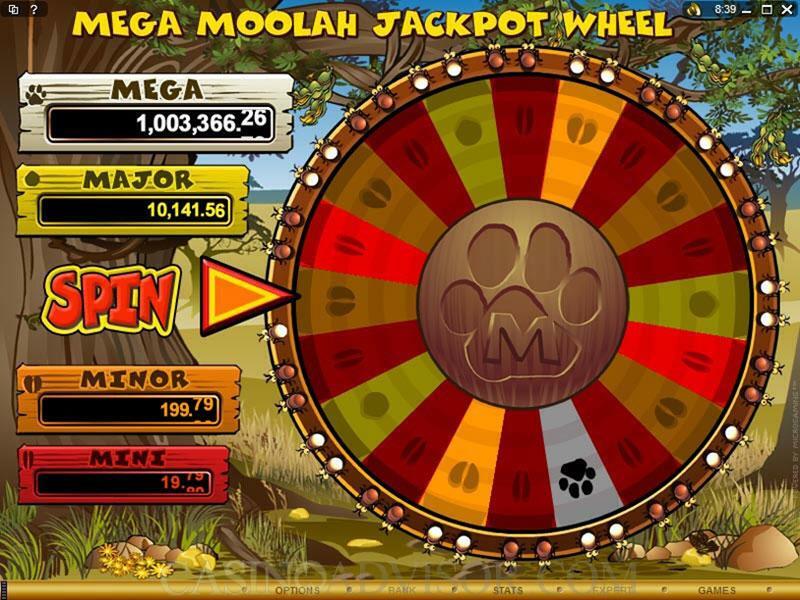 Mega Moolah features a wild (which also serves as a multiplier) as well as a scatter, which kicks off the Free Spins Bonus Game. That's where you want to be if you want to win the big money, or more appropriately, the "Mega Moolah." The Mega Moolah progressive slot game has a scatter, the Scatter Monkey symbol, and the good thing about scatters is that this symbol can be anywhere on the five reels to complete winning scatter combinations as long as two or more of them show up on the five reels. When three or more Scatter Monkey symbols appear, it ignites the Free Spins Bonus Game. Mega Moolah also has a wild symbol, the Wild Lion. Wilds, as a rule, can serve as a substitute to complete winning combinations for everything but scatters. 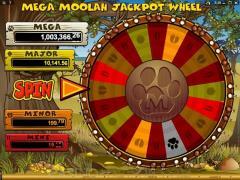 In this case, the wild is also a multiplier; it serves to double the payout of any winning combination it completes. 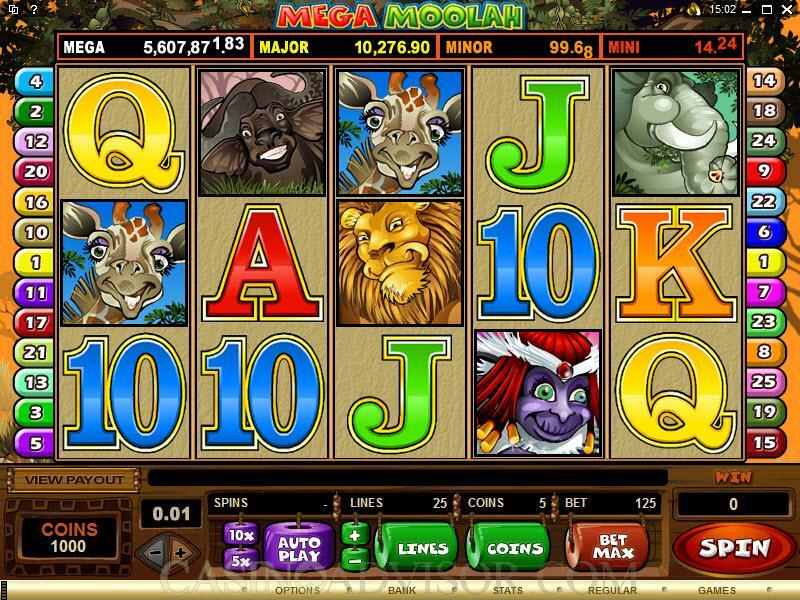 Mega Moolah features the Free Spins Bonus Game, which becomes triggered when three or more of the scatter symbols (the Scatter Monkeys) appear anywhere on the five reels. The Free Spins Bonus Game gives you 15 free spins. during which time any wins you gather are tripled. Then you can win an additional 15 spins if three or more scatter symbols appear once again. There is no Gamble Bonus Game here, but there is a random bonus game that is played and is rewarded at random. What happens is that the more you are betting at the time, the better the chance of winning the jackpot. You're going to spin a wheel here, and you have the opportunity win the Mega, Major, Minor or Mini jackpot. The minimum coin size in Mega Moolah is 0.01, with the maximum set at 0.05. There are 25 paylines and the maximum bet in the game is 125 coins. You can affect a maximum bet at any time can get this maximum by clicking the "Bet Max" button at the bottom of the interface. Interested in reading more detailed information about Mega Moolah? If so Click Here for more details.